I just picked on of these up used from craigslist last weekend, it is however a central machinery, about 8-10 years old, i suspect yours is from the same ilk, might try to find one from them, i’ll root around and see what i can come up with, usually can find something on the interwebs, heavy little devil, but sure can move some material. I don’t know about owners manual. It is old Disk Sander. 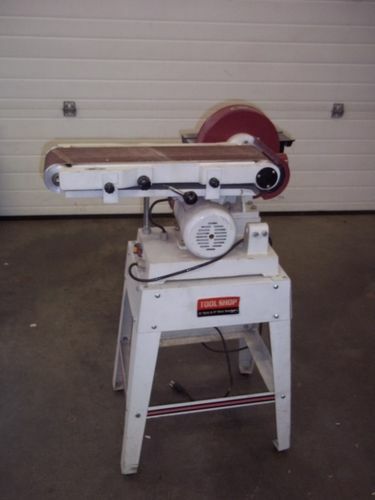 I really like POWERTEC BD6900 Woodworking Belt Disc Sander. I make a lot of trinket boxes and cutting boards and this tool has come in quite handy. It is Easy to buy and change belts. It is a bit noisy, but I can put up with the noise while it gets the job done. The only thing is the bag on the side where the dust goes into, you need to snug it up as much as you can to the machine in order for the dust to properly get into the bag. O, and beware of the power of this machine. You can easily loose a fingernail.